The V Foundation has the best home team advantage ever: generous North Carolina supporters and world-class cancer research partners. North Carolina cancer centers stand at the forefront of cancer research. The V Foundation has awarded over $17.4 million in grants in our home state. Plain and simple, funding research in North Carolina has always been a very smart investment. 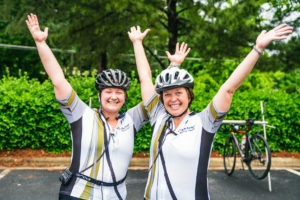 The V Foundation’s Victory Ride to Cure Cancer presented by Braswell Family Farms benefits Duke Cancer Institute, UNC Lineberger Comprehensive Cancer Center and the Wake Forest Baptist Health Comprehensive Cancer Center, as well as breakthrough cancer research nationwide. A collaborative powerhouse at the center of a world-renowned university and medical center, Duke Cancer Institute (DCI) is built to move forward rapid innovation and novel treatments. Established in 1973 as one of the original eight comprehensive cancer centers designated by the National Cancer Institute, today, DCI cares for patients from every county in North Carolina, every state in the nation and from countries around the world. It is home to more than 300 researchers and physicians and is involved in clinical and research partnerships in India, China, Singapore and across the U.S. The University of North Carolina Lineberger Comprehensive Cancer Center brings together some of the most exceptional physicians and scientists in the country to investigate and improve the prevention, early detection and treatment of cancer. We are one of only 49 National Cancer Institute-designated Comprehensive Cancer Centers in the country and the only public institution to earn this distinction in North Carolina. Our faculty work in the laboratory, at the bedside and in the community to understand the causes of cancer at the genetic and environmental levels, to conduct groundbreaking laboratory research, and to translate findings into pioneering and innovative clinical trials. The Wake Forest Baptist Health Comprehensive Cancer Center in Winston-Salem, N.C., is proud to be among an elite group of cancer centers acknowledged as the nation’s leaders in the fight against cancer. Wake Forest Baptist Health Comprehensive Cancer Center is proud to have been one of the first centers to receive a National Cancer Institute (NCI) designation and earned NCI comprehensive status in 1990, ensuring patients have access to the latest treatments, research, technologies and clinical trials. A long history of research collaboration and education has advanced the most promising new treatment options available to cancer patients. At the Wake Forest Baptist Health Comprehensive Cancer Center, the focus is on providing the best cancer care available, in a caring and compassionate manner.